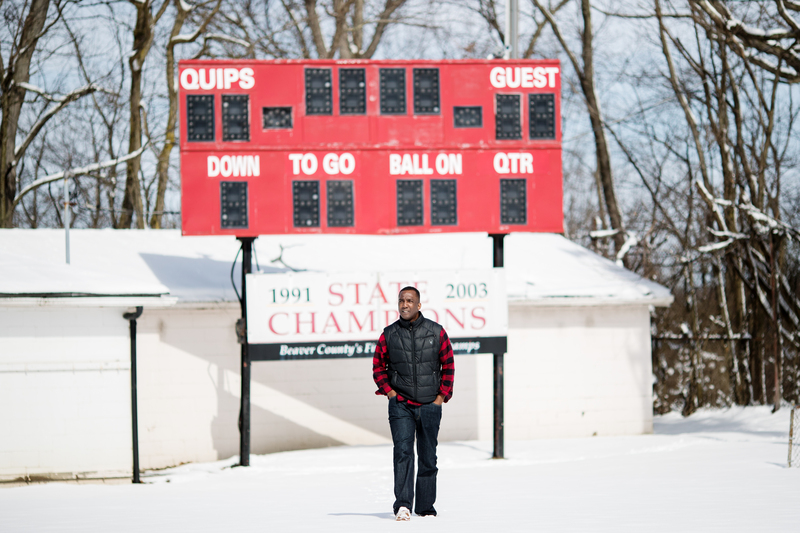 ALIQUIPPA, Pa. — At the winningest high school program in the football mother lode that is western Pennsylvania, a team that has produced multiple NFL Hall of Famers, the locker room is in a shambles. Holes gape in the ceiling. Red and black paint flakes off the cinder block walls. Foam pokes through the ripped cover of the only training table. There are no showers. Outside, in the stadium known as the Pit, the entire north side of the stands has been condemned as unsafe. Mike Warfield surveyed the wreckage last Thursday, his first day as the new head football coach of Aliquippa High School. Thirty years ago, Warfield suited up in this room as a quarterback for the Quips. Back then, the space was nicer than his single mom’s apartment in the Linmar Terrace projects. Now, Warfield’s first task is to secure $30,000 in donations for repairs that the impoverished school district can’t afford. Alquippa’s high school football stadium, known as “The Pit,” needs $30,000 worth of repairs that the school district can’t afford. The next task is winning. The talent never dries up in Aliquippa, hometown of Tony Dorsett, Mike Ditka, Darrelle Revis, Ty Law and Sean Gilbert, to name a few. In a high school with only 287 students, last season’s football team had at least four Division I prospects. The real challenge lies outside the Pit, down the hills leading to the Ohio River, in a town built and then strangled by steel’s rise and fall and now kept alive by young black athletes. Aliquippa has about 9,100 residents, 39 percent of them black and 58 percent white. A third of the town lives below the poverty line. The public schools are 80 percent black, with test scores among the lowest in the state. 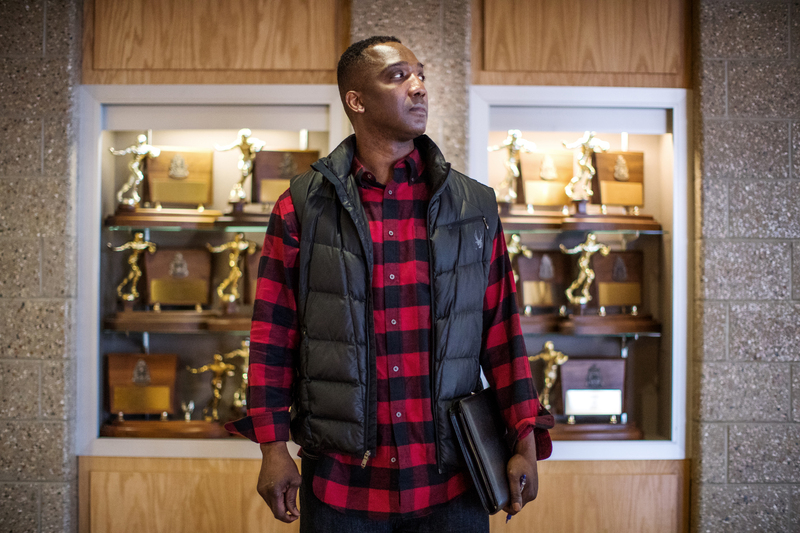 Warfield, a Pennsylvania state trooper and the first African-American coach in 103 seasons of Aliquippa football, must heal divisions over the majority-black school board ousting his legendary white predecessor. Most importantly, Warfield must guide his players, most of whom will never go pro, to productive lives. Mike Warfield, the newly appointed head coach of Aliquippa’s high school football team, was a quarterback for the school 30 years ago. 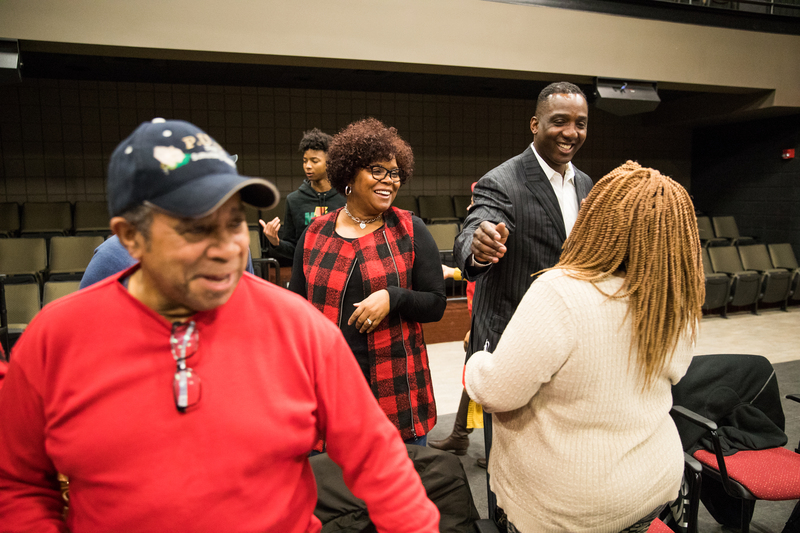 With all due respect to Dwan Walker, who was elected the town’s first black mayor in 2012, Warfield is Aliquippa’s Barack Obama. Football is by far the most important institution here, which makes Warfield a powerful symbol of change. As black athletes refuse to shut up and dribble, Warfield represents African-Americans earning the opportunity to run the whole show — not just the ball. This change did not come easy, though. Nothing comes easy for Quip. Mike Zmijanac reigned for 21 seasons as Aliquippa’s football coach, also serving as athletic director and, for seven seasons, the basketball coach. On the gridiron, he amassed a 237-36 record, six championships in the Western Pennsylvania Interscholastic Athletic League (WPIAL) and one state title. The 112-year-old WPIAL spans 10 counties, with a long list of NFL alumni ranging from Hall of Famers Joe Montana, Joe Namath and Dan Marino to current stars Aaron Donald and Rob Gronkowski. Zmijanac (pronounced Smee-AN-ack) is 74 years old. His contract was up in April. He wanted to coach one more season and then retire. But on Feb. 21, the school board voted 7-2 to move on, then refused to publicly comment on its decision. Football trophies are prominently displayed at Aliquippa High School. But conversations with more than two dozen Aliquippa natives — including players, assistant coaches, parents and school board members — revealed much discontent. Part of this is the nature of small-town life, where petty slights turn cancerous and dense webs of family ties breed lasting grudges. Also, school boards everywhere decapitate successful coaches for all sorts of reasons, from playing time for officials’ kids to personal vendettas. Since almost all of Aliquippa’s players are black, the criticism was concentrated in the black community. Some described Zmijanac as distant from his players. He lives in Mount Lebanon, a 40-minute drive from school. People have long complained that Zmijanac was disengaged from the recruiting process, which holds the same life-or-death importance in Aliquippa as Ivy League applications do for rich kids. The family of Kaezon Pugh, a Pitt recruit now at Howard University, claims Pugh missed a U.S. Military Academy opportunity because Zmijanac didn’t give him a letter from West Point. Graduating senior Kwantel Raines, a West Virginia recruit, said he missed playing in Pennsylvania’s Big 33 Football Classic all-star game because Zmijanac didn’t nominate him. Of course, colleges would find blue-chippers such as Pugh and Raines if they played on another planet. The kids Aliquippa worries about are capable of playing in Division II or III but need an advocate to avoid missing out on an education. To be fair, dealing with college recruiting can be a nightmare. Parents have unrealistic expectations. Kids with no self-awareness ignore anything less than big-time Division I programs, not realizing the life-changing value of free college. Many players don’t have the necessary grades. In a phone interview with The Undefeated, Zmijanac declined to address his critics on the record. All he wanted to say was, “They made a great choice in Mike Warfield.” Zmijanac was an assistant coach when Warfield played, and Warfield later worked as an assistant under Zmijanac. Beyond recruiting, there were complaints that Zmijanac and the Quips could have been more successful on the field. For the past 50 years, Aliquippa has played a smashmouth running game. With big, swift athletes such as Swanson, Askew-Henry and Pugh, it worked — until the state playoffs, when competition got stiffer and opponents stacked defenders in the box. Zmijanac’s teams lost in the state finals in 2000, 2012 and 2015. His lone state title came in 2003, when future Hall of Famer Revis rushed for three touchdowns, returned a blocked field goal for a score and took a kickoff to the house — five touchdowns in a 32-27 victory. One state ‘chip in 21 years? That ain’t enough for Quip. The team didn’t even make states last season, losing the WPIAL championship game at the Pittsburgh Steelers’ Heinz Field by the humiliating score of 2-0 to underdog Quaker Valley. The Quips committed 20 penalties that cost them 190 yards. Many people said they appreciated Zmijanac but understood the need to move on. 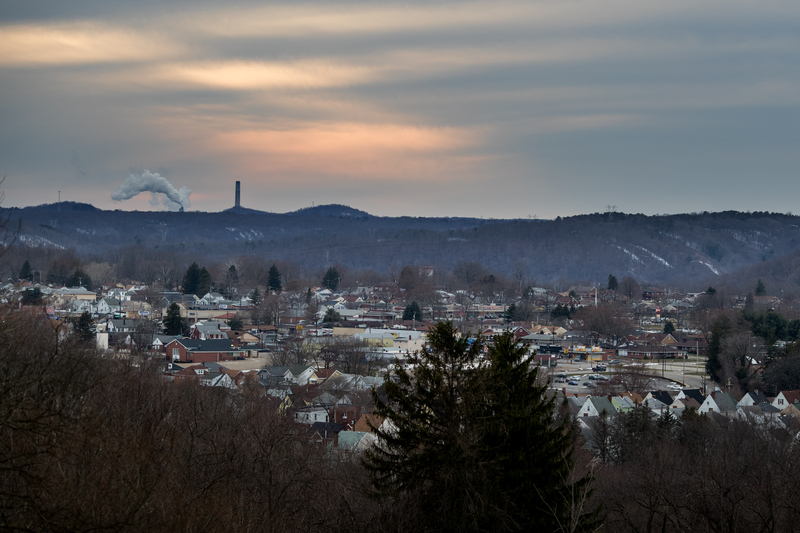 Aliquippa’s economy has declined along with the steel industry. In 1905, the Pittsburgh steel company Jones and Laughlin started buying land 24 miles up the Ohio River around a village named after a Seneca Indian queen. As the furnaces roared to life, J&L Steel divided its tightly controlled territory into 12 residential sections called “Plans.” This company-owned housing was segregated by ethnic group: American whites, blacks, Poles, Slovakians, Serbs, Croatians, Italians, Irish, Germans, Nordics. Blacks worked in the mill but were confined to the worst, lowest-paying jobs. As early as 1916, though, one black player per season appeared on the Aliquippa High School football team. The Plans’ racial lines blurred over the decades, with sports a consistent unifier. Aliquippa’s population peaked near 30,000 in the 1960s. Race riots erupted at the high school, spurred by protests over black girls being excluded from the cheerleading squad. When the steel industry collapsed, Aliquippa cratered into poverty and drug dealing. Race relations deteriorated further in 2001 when a white police officer was shot in the head in Linmar Terrace, N-words were hurled by cops looking for the killers, and state investigators looking for corruption in the local force focused almost entirely on black cops. Today, not only are storefronts on Franklin Avenue, the once-bustling main drag, empty, but entire buildings are abandoned, with doors swinging open. Blacks now hold the mayor’s office and seven of nine school board seats. So when Zmijanac was voted out, everyone assumed the next coach would be black. For some white people, that meant racism. Black people saw common sense. Much research shows that black role models make a unique difference in the lives of black youths. Aliquippa kids need that difference. In 2016 alone, a former Aliquippa quarterback and decorated Marine veteran was shot and killed. A defensive back committed suicide. And two players were charged with murder in the robbery of a small-time marijuana dealer. With many black Quip alumni coaching around the WPIAL, why not find one to lead the team, someone who walked the same troubled streets as the players do now? Perhaps someone like Warfield, a 6-foot-5-inch, 242-pound baller-turned-cop, married with three kids and responsible for bringing down one of the county’s largest drug gangs, based in the same Linmar Terrace projects he grew up in? Warfield, 48, graduated from Aliquippa in 1987 and passed for almost 7,000 yards at Catawba College, a Division II school in North Carolina. After college he was back home, drifting, when a former Quip coach encouraged him to join the state police. He’s been the quarterbacks coach at nearby Central Valley High School the past four seasons. He will retire from police work in July, with 25 years of service, to devote himself to Aliquippa football. “We’re a predominantly black school. All of a sudden, we’re racist because we hired a black coach?” said school board member Maurice Cary, a volunteer assistant coach under Zmijanac. “Look at this man that we hired. He stands up to anybody, any human being, regardless of race. We’re really proud of who we hired. It’s impossible to remove race from the equation, though. This is America, after all. We’ve seen some things. “Tell me something,” Aileen Gilbert said to me after Warfield was hired. “You’re a white board, you hire a white man because you don’t want to put one of us in a position of authority. So now we have a black board, with seven women and two men. We reflect the community. We look like the community. They didn’t. But they wanted to keep the power. And we took it. “I love it,” Gilbert said. She laughed, but she didn’t sound happy. Mike Warfield gets congratulations at the school board meeting in which he was appointed the school’s new head football coach. The school board could have brokered a gracious exit for Zmijanac, who will be inducted into the Western Chapter of the Pennsylvania Sports Hall of Fame on April 21. They chose another route. One that satisfied some of Zmijanac’s enemies. David Askew, Kaezon Pugh’s father, is the one who put the missing West Point letter on blast. In a typically tangled Aliquippa family tree, Askew met and married Darrelle Revis’ mother, who is Aileen Gilbert’s daughter, after serving seven years in prison for third-degree murder. The day before Zmijanac was ousted, Askew posted a video telling a story of how, on his first day of high school more than 20 years ago, Zmijanac kicked him out of class for no apparent reason. Football has sustained Aliquippa through its toughest times, bringing the whole town together on Friday nights to experience the thrill of success. But the population and tax base keep shrinking. Nearby school districts have merged. 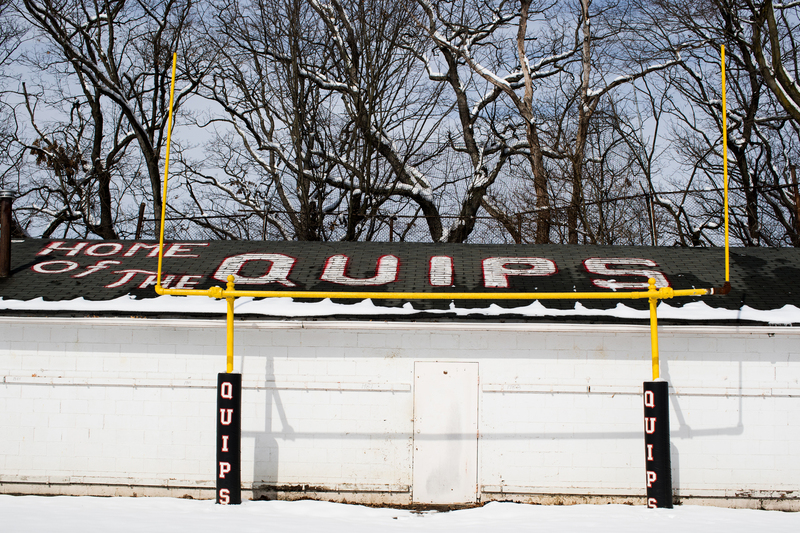 Can football help keep Quip alive? “It has to,” Warfield said, leaving the decrepit locker room. A snowstorm on the second day of spring had dumped 6 inches on the stadium, making the Pit look almost pretty. Warfield walks the field of “The Pit” the day after his appointment as the school’s first black head coach. Warfield’s Quips will throw the ball. The team is loaded with talent; three players have scholarship offers from West Virginia, Syracuse, Oregon State, Toledo, the U.S. Military Academy and Howard, with more on deck. But Warfield will define success by how many under-recruited kids he gets into college, with or without football. “The tensions that occurred, that’s out of my control,” Warfield said. “But I think at this point my job is to try to bring everybody back together. Just being here every day, them seeing me every day. You can’t trust nobody you’ve never seen. You can’t believe in nobody who don’t believe in you or talk to you and tell you they believe in you. Those are the things that I’m gonna try to do, just to make the kids and the parents feel that I’m one of them.